Join us Saturday, February 2, 2019 from 6-9pm at Gallery Fifty5, located at 55 Greenkill Ave., Kingston, NY for a special reception with award-winning artist, Brian C. Zickafoose. A recent transplant from West Virginia to the Hudson Valley, this will be Brian’s New York gallery debut. The Psychedelic Country exhibit will run at Gallery Fifty5 from February 2-16. Works featured at this show are an exploration of light and depth. This exhibit also features a dozen small original paintings called, PSY-Matics, which are an exploration of how light is expressed through sound. Complimentary Vegan refreshments and beverages will be provided. Fayette County, West Virginia based oil painter, Brian C. Zickafoose is pleased to announce that two of his original paintings have been selected to be included in the upcoming 10th Annual Best of WV Open Juried Exhibition, which will be on display at the David L. Dickirson Fine Arts Gallery at Tamarack: Best of West Virginia from June 16 – August 5, 2018. It’s a rare occasion that you get to spend an entire week hanging out and painting with your art heroes. In July 2017, I had the honor and privilege to do just that when I travelled to Wappingers Falls, New York to attend the Visionary Art Painting Intensive, hosted by world renowned artists Alex and Allyson Grey at the Chapel of Sacred Mirrors (CoSM). I previously attended the workshop back in 2015 and it up-leveled my art business so significantly that I vowed to return as soon as physically possible, and next time bring my wife and two daughters so they might also experience the magic. We convened with 20 artists from around the world for the painting adventure of a lifetime. Our objective — to make substantial progress on two paintings: a self portrait and a visionary painting of our choice. It began with a prayer to the Divine Creative Spirit. Typical daily activities consisted of in-depth lectures on the history of visionary art, portfolio presentations from each resident artist and multiple painting sessions. Open studio in the evenings allowed for my family and other folks to join in the fun and paint. Late night art-ing was increasingly common as the week progressed and painters dug deeper into their works. Nestled on a gorgeous stretch of the Hudson River Valley, CoSM was the perfect setting for an artist retreat and the lush property afforded a plethora of natural wonders to stoke the creative fires. Morning strolls on the Wisdom Trail, sunsets at the cistern and watching tiny frogs dance though rays of sunlight at the reflecting pond all made for inspiring moments. The Grey’s are talented artists and well studied teachers. Each participant in the course received a personal consultation with an ‘ask us anything’ approach. At the end of the course, the group critique session was filled with love and encouragement and sound advice for improvement. There were numerous take home points but these four notes resonated with me the most. 1. Art IS a valid spiritual practice. Sacred art is one of the most ancient practices known to man. Cave paintings dated over 10,000 years ago depict “mushroom men” engaging in hunting rituals with strange beasts. From times unknown, the World’s great religious and spiritual movements have utilized art as a method for healing and expressing the divine. Nurturing a healthy creative and spiritual network can mean the difference between success and failure. The assemblage of talent at CoSM was unrivaled. Making art is usually a solitary act. Immersing oneself in an all encompassing creative environment had a remarkably transformative effect on one’s perspective. Anything seemed possible. Interaction with the other artists allowed for in-depth observation of the various technical approaches and the unique influences each artist brought to their work. Deep friendships were forged over lengthy painting sessions laced with banter about philosophy and the challenges of making art. There was an undeniable synergy between all of the creative bodies drawing inspiration from each other. Once upon a time, Alex and Allyson Grey were working artists operating their studio in the Chelsea District of New York City. They dreamed of uniting the international visionary art community and creating an enduring sanctuary of visionary art for all to behold. Years later, with the help of many friends, they purchased property in upstate NY and transformed the existing facility into a spiritual epicenter with a functioning bed and breakfast that hosts a variety of art events through the year. Their dream will come to fruition later this year when they open the doors to the epic, three-story art exhibit known as Entheon. Step by step, they made necessary moves to make it all happen. Two artists and a lot of love did this. As I pondered this notion, I gazed out the window of the studio classroom at the construction being done on the Entheon structure and I considered the possibility that I needed to seriously reconsider my goals. I needed to dream bigger… much, much bigger. Having my wife, Jenny and my two young daughters, Xia and Zenna accompany me to CoSM was a dream come true for us all. My wife and I take great pride in raising creative kids and we spend most of our spare time playing music and making stuff together. My heart nearly burst with joy as I watched my children playing with paint brushes in hand, learning and interacting with world class artists. My wife and our daughters cherished the unique insight provided by Allyson Grey about the challenges and rewards of being a professional artist and parenting kids. We were reminded all week that the energy we invest in each other matters. As we packed up our gear and took our photos on the final day, Alex and Allyson expressed gratitude to my wife and I for bringing our children. They told us that by being a conscious family and by loving one another we were healing broken hearts and teaching lost souls how to love. For me that was the golden moment that validated everything; that simply focussing on loving myself and my family was the greatest expression of art that I could engage. That ultimately being a better artist meant being a better person. It concluded with hugs and tears of joy. The Grey’s were gracious hosts who opened up their hearts and home and provided an enriching, family friendly learning environment. 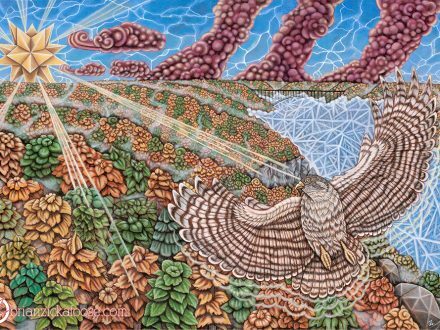 Blessed are the brethren who made the pilgrimage to the 2017 Visionary Art Painting Intensive. It was truly an honor to attend and I will forever be grateful for the opportunity to be a part of the community at CoSM. This program was presented with financial assistance by the West Virginia Division of History and Culture and the National Endowment for the Arts, with approval from the West Virginia Commission for the Arts. 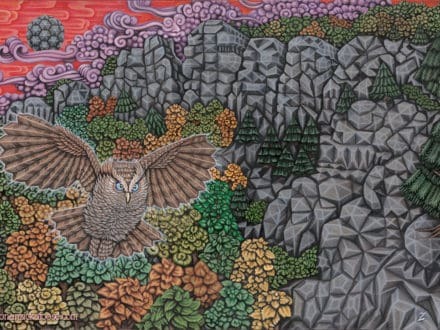 West Virginia artist, Brian Zickafoose has been awarded the Professional Development Grant to attend the Visionary Art Painting Intensive with Alex Grey and Allyson Grey. The Visionary Art Painting Intensive will take place from July 16-22, 2017 at the Chapel of Sacred Mirrors (CoSM) in Wappingers Falls, NY. 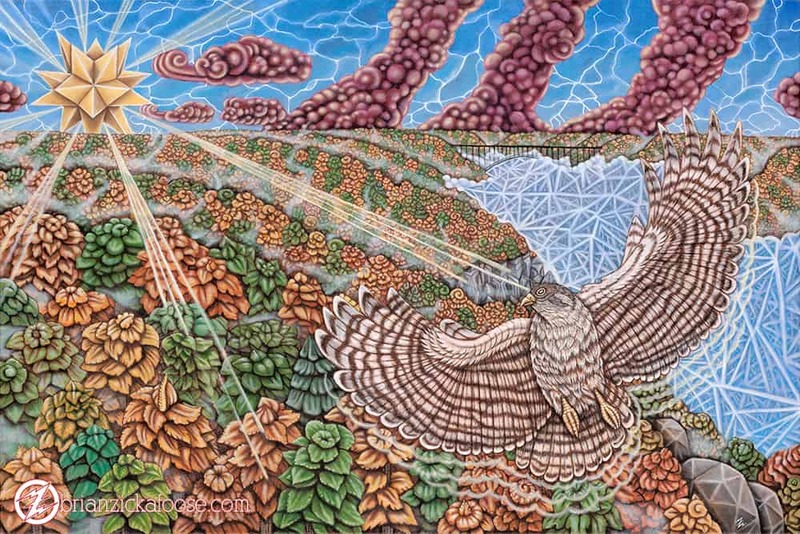 The annual workshop – attended by accomplished painters from all over the world – is a hands on training course that will provide an in depth study into visionary painting, as presented by world-renowned visionary artists, Alex and Allyson Grey. This program is presented with financial assistance from the West Virginia Division of Culture and History and the National Endowment for the Arts, with approval from the West Virginia Commission for the Arts. Whooo loves to paint? Apparently owls do. 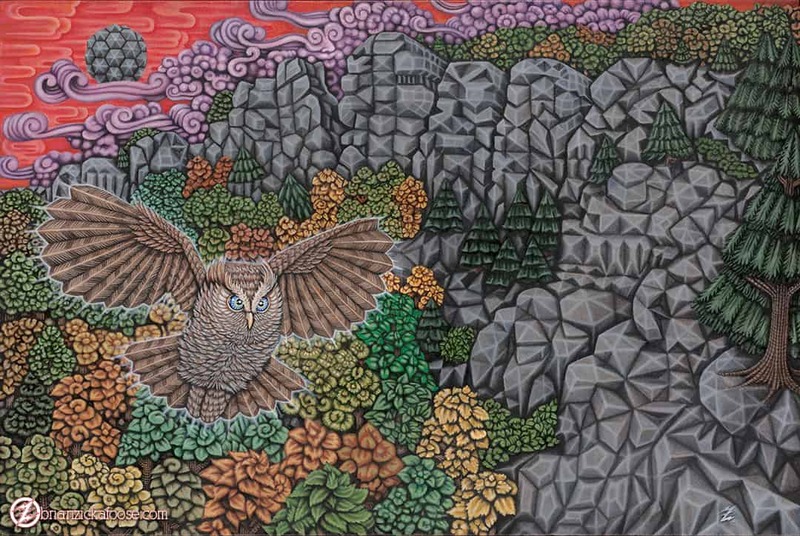 Watch as a family of screech owls play and paint the afternoon away at Seneca Rocks, West Virginia. Please subscribe to my channel and share if you enjoyed this feature presentation. The links for purchasing prints are below. Thank you for watching. by West Virginia visionary artist, Brian C. Zickafoose. Here we have the second installment in the Flight of Fancy Series by visionary artist, Brian C. Zickafoose. Our friend Fancy is suspended inside a torus shaped subatomic chamber as photon beams stream past in blinding speeds. The static of uncertainty dispatches on bulbous monitor screens across the walls of the chamber as we turn the corner ever faster. “Do you see?” – asks Fancy in a feverish whisper. Limited edition paper and canvas prints are available.